We developed a novel surgical approach for intratracheal administration of bioactive agents into the mouse fetus. The delivery route is more efficient in targeting the fetal mouse lungs than the commonly used intra-amniotic injection. This procedure has to date not been described in a mouse model. Carlon, M. S., Toelen, J., da Cunha, M. M., Vidović, D., Van der Perren, A., Mayer, S., Sbragia, L., Nuyts, J., Himmelreich, U., Debyser, Z., Deprest, J. 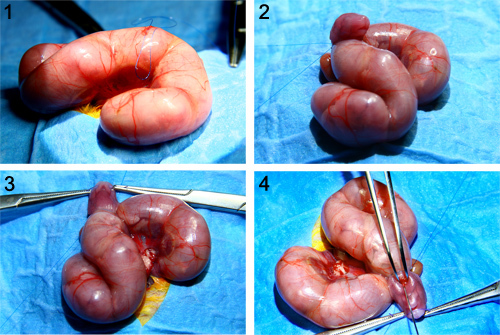 A Novel Surgical Approach for Intratracheal Administration of Bioactive Agents in a Fetal Mouse Model. J. Vis. Exp. (68), e4219, doi:10.3791/4219 (2012). Prenatal pulmonary delivery of cells, genes or pharmacologic agents could provide the basis for new therapeutic strategies for a variety of genetic and acquired diseases. Apart from congenital or inherited abnormalities with the requirement for long-term expression of the delivered gene, several non-inherited perinatal conditions, where short-term gene expression or pharmacological intervention is sufficient to achieve therapeutic effects, are considered as potential future indications for this kind of approach. Candidate diseases for the application of short-term prenatal therapy could be the transient neonatal deficiency of surfactant protein B causing neonatal respiratory distress syndrome1,2 or hyperoxic injuries of the neonatal lung3. Candidate diseases for permanent therapeutic correction are Cystic Fibrosis (CF)4, genetic variants of surfactant deficiencies5 and α1-antitrypsin deficiency6. Generally, an important advantage of prenatal gene therapy is the ability to start therapeutic intervention early in development, at or even prior to clinical manifestations in the patient, thus preventing irreparable damage to the individual. In addition, fetal organs have an increased cell proliferation rate as compared to adult organs, which could allow a more efficient gene or stem cell transfer into the fetus. Furthermore, in utero gene delivery is performed when the individual's immune system is not completely mature. Therefore, transplantation of heterologous cells or supplementation of a non-functional or absent protein with a correct version should not cause immune sensitization to the cell, vector or transgene product, which has recently been proven to be the case with both cellular and genetic therapies7. In the present study, we investigated the potential to directly target the fetal trachea in a mouse model. This procedure is in use in larger animal models such as rabbits and sheep8, and even in a clinical setting9, but has to date not been performed before in a mouse model. 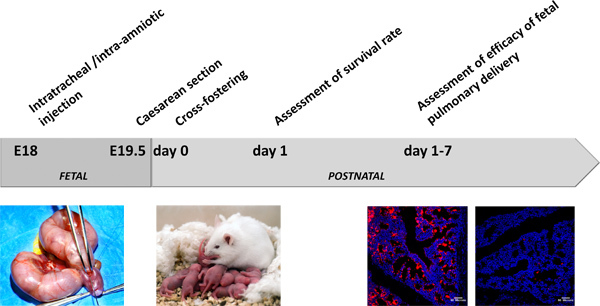 When studying the potential of fetal gene therapy for genetic diseases such as CF, the mouse model is very useful as a first proof-of-concept because of the wide availability of different transgenic mouse strains, the well documented embryogenesis and fetal development, less stringent ethical regulations, short gestation and the large litter size. Different access routes have been described to target the fetal rodent lung, including intra-amniotic injection10-12, (ultrasound-guided) intrapulmonary injection13,14 and intravenous administration into the yolk sac vessels15,16 or umbilical vein17. Our novel surgical procedure enables researchers to inject the agent of choice directly into the fetal mouse trachea which allows for a more efficient delivery to the airways than existing techniques18. Time mate pregnant NMRI mice so that they are 18 days (E18) pregnant (total gestation E19.5) at the time of surgery. Prior to and after surgery they are housed in filter top cages at normal room temperature and normal daylight with free access to water and chow. First submit the pregnant NMRI mouse to general anesthesia with 1.5% isoflurane in a mixture of O2 at 1.5 L/min. The level of isoflurane depends on the age and strain of the mouse, but in general isoflurane should be at a level that puts animals in the anesthetic state .Then put the pregnant mouse on a heating pad (37 °C) to maintain body temperature during surgery. The whole surgical procedure is performed by two surgeons. One surgeon will perform the dissection of the pregnant mouse and subsequent exposure of the fetus for intratracheal injection. The second surgeon will perform the fetal intratracheal injection itself. The surgical procedure is performed using sterile instruments and an aseptic technique. Disinfect the abdomen with povidone iodide and perform a median laparotomy to expose the pregnant uterus. Exteriorize one uterine horn at a time and count the number of gestational sacs. One fetus per horn is operated on and chosen based on the optimal position for exteriorization of the fetal head in subsequent steps. The most suitable fetus is selected by visualization through the uterine wall. The nose of the fetal head should point towards the surgeon who will inject into the trachea after exposing the fetal head and fixing it backwards (as explained in subsequent step 2.5). First pass a 6-0 polypropylene (Prolene) purse string suture of approximately 1 cm in diameter through the uterine wall and the fetal membranes (amniotic membrane and parietal yolk sac) over the area where later on the fetal head will be exposed through. This suture keeps the fetus fixed inside the uterus from the shoulders onwards. Next, make an incision in the uterus inside the purse string of approximately 0.8 cm using sharp scissors. Gently squeeze the head and the neck of the fetus through the hysterotomy. Pull the purse string suture gently tight around the neck and fix it in position with 2 Micro-Mosquito forceps. The fetal head is kept in hyperextension by a 5-0 polyglactin 910 (Vicryl) suture on two forceps placed into the mouth around the upper jaw. Under stereoscopic zoom microscopy (x10 magnification) the fetal trachea is visualized by making a vertical neck incision using sharp and blunt dissection. The incision in the neck region is about 5 mm long. It is a superficial incision, as the underlying tissue is further dissected using blunt dissection to reach the trachea. Under direct vision through the stereoscopic zoom microscope, inject a total volume of 30 μl of substance (e.g. fluorescent beads or viral vector) into the trachea using a 50 μl Hamilton Glass Syringe with a 30 G sharp needle. After removal of the needle, minimal efflux of the injected liquid ensures a correct injection. The incision is not closed after injection. To replace the head in the uterus, apply gentle pressure on the nose. The neck first goes back into the uterus, followed by the head. The nose goes in last. Next, close the hysterotomy by tightening the purse string. Then inject a total of approximately 0.5 ml of physiological solution into the amniotic cavity to prevent oligohydramnios. To do so, insert a needle into the incision inside the purse string. Next, close the suture around the needle, after which saline is injected. In a last step, retract the needle, followed by completely closing the purse string. Close the maternal abdominal wall (peritoneum and inner and outer muscle layer) and skin with a 5-0 Vicryl running suture in two separate layers. Thereafter, infiltrate the incision with 0.2% xylocaine for post-operative pain relief. It is recommended to use buprenorphine (0.05 - 0.1 mg/kg SC or IP) for post-operative pain relief. Neither prophylactic tocolytics nor antibiotics are used. The mice are kept on a heating pad (37 °C) until they are fully recovered (approximately 1 hr). Disinfect the abdomen with povidone iodide and perform a median laparotomy to expose the pregnant uterus. Exteriorize one uterine horn at a time and count the number of gestational sacs. I.A. injection can be performed on all fetuses as it takes less time to perform. Furthermore, the position of the fetus is not critical compared to intratracheal injection. As the uterine wall is semi-transparent, the fetal structures such as the head, limbs and tail and placental position are nicely visible. Using the same needle and syringe as above (2.7), inject 30 μl of substance in the vicinity of the fetal mouth. This can be done most easily either between the fetal head and forelimbs, or between the lower limbs and the tail. The injection is only performed after careful examination of the position of the needle to ensure that no fetal structures are in contact with the tip at the time of injection. The uterus is repositioned in the abdomen and the abdominal wall and skin closed as described above (2.9). Kill the dam using an approved euthanasia method 36 hr after the fetal intervention (at E19.5). Cervical dislocation without additional anesthesia would be the best method, as all other forms of euthanasia that include anesthesia (e.g. isoflurane, pentobarbital) will anesthetize or even kill the fetuses, which you would want to avoid at all times. Deliver the operated-on fetuses by caesarean section. The operated fetuses are identified in the uterus by their position. Amniotic sacs are numbered starting at the ovarian end of the bicornuate uterus. After delivery, the following criteria are used to assess the viability of the fetuses: the presence of (1) a heartbeat, (2) pink skin color (versus cyanotic) and (3) spontaneous movements. Place only pups fulfilling these criteria in a foster mother's litter containing one-day old pups. By experience we know that pups with a weak heart beat, cyanotic skin color and/or minimal spontaneous movements will often not survive due to rejection from the foster mother's litter or by maternal cannibalism. After delivery of a visible dye via I.T. or I.A. injection (e.g. red fluorescent molecules), it is possible to assure a correct injection by the presence of this dye (pink color from the injected red fluospheres) in the thoracic (by direct injection into the lungs after I.T. injection, or by inhalation into the lungs after I.A. injection) or abdominal cavity (by ingestion). This is possible due to the fact that newborn mice are semi-transparent allowing for in vivo assessment of the lungs and stomach. Mark the correctly injected pups with Chinese Ink subcutaneously above the tail basis. Place all the pups, which fulfill the requirements mentioned in 4.2 in the foster mother's litter. To assure maximal acceptance and survival of the operated-on pups, leave no more than 10 pups in total in the foster mother's litter (both her own 1 day old pups, as well as the cross-fostered pups). Before placing the operated-on pups in the foster mother's litter, cover them in bedding material from the foster mother, containing both her feces and urine to mask any non-familiar smells. Place the cage in a quiet environment and don't disturb the litter for at least 12 hr (overnight). The following day, carefully assess the survival rate of fostering by counting all pups, making the distinction between the foster mother's pups and the operated-on pups (marked with Chinese Ink and on average smaller than the other pups). Minimize the manipulation time of these pups to avoid rejection by the mother and to avoid hypothermia. In general, if pups don't have any milk in their stomach (which is visible due to the semi-transparent nature of newborn pups), the prognosis is very poor for further survival of these animals. The overall scheme of the experiment is depicted in Figure 2. To determine the optimal volume for I.T. injection, we empirically chose different volumes ranging from 10, 20 to 30 μl (n=3/volume). For easy detection, we chose to inject red fluorescent molecules (fluospheres, Molecular Probes, Leiden, The Netherlands) sized 100 nm. After I.T. injection in E18 old fetuses, the lungs were harvested 24 hr later, fixed in 4% paraformaldehyde overnight at 4 °C and 6 μm frozen sections were made. Nuclei and actin filaments were stained with Hoechst 33258 (Sigma-Aldrich, Bornem, Belgium) and Alexa Fluor 488 phalloidin (Invitrogen, Merelbeke, Belgium) respectively for 20 min at room temperature. Confocal images were made using a Biorad Radiance 2100 Confocal microscope with LaserSharp2000.6 software by Carl Zeiss. The relative fluorescence (ratio of red to blue fluorescence representing fluospheres and nuclear staining, respectively) was quantified using ImageJ online software (Figure 3). Although at the time of fetal surgery, a backflow was detected only after injection of 30 μl, indicating an excess of fluids injected, 30 μl gave the highest amount of fluorescent signal in the lung parenchyma as quantified by measuring the relative fluorescence (analysis of variance, comparisons for each pair using Student's t-test, *p < 0.05, ***p < 0.001). Next, we wanted to compare the efficiency of targeting the fetal mouse lung after I.T. versus I.A. injection. To do so, 30 μl of fluospheres were delivered to the fetal mouse lung after either I.T. or I.A. injection in E18 pregnant NMRI mice (n=5 per group). I.T. injection resulted in a significantly higher delivery of fluospheres to the fetal lung compared to the I.A. route (1.43 ±0.56 and 0.05 ± 0.02 relative fluorescence (ratio of fluospheres to Hoechst respectively, analysis of variance, Student's t-test, *** p<0.001) (Figures 4 a-c). Untreated control fetuses were used for normalization of fluorescent background signal. The gastro-intestinal tract was positive for both the I.T. and the I.A. injected animals (Figure 4 d). No red fluorescence was observed in other tissues from treated fetuses or in the negative control animals (data not shown). After comparing both delivery methods by injecting fluorescent molecules, we wanted to evaluate the efficiency of viral transduction and subsequent gene expression after I.T. and I.A. injection using rAAV vectors. rAAV2/6.2 encoding firefly luciferase (fLuc) (3x1010 GC/fetus) under the control of the chicken-β-actin (CBA) promoter was injected I.T. (n=8) or I.A. (n=6) in fetal NMRI mice at E18. After caesarean section and fostering, surviving pups were followed up by non-invasive bioluminescence imaging (BLI) and monitored for fLuc activity (photons/second, p/s) at 1 week of age (Figure 5). The total photon flux for the I.T. group was significantly higher than that in the I.A. group and the negative control (analysis of variance, comparisons for each pair using Student's t-test, *p<0.05). The average BLI signal in the I.A. group was not significantly higher than that in the negative control group. Distinction between a correct and an incorrectI.T. injection can be assessed at several levels. At the time point of surgery, during injection into the fetal trachea, no resistance will be noticed when the needle is positioned in the trachea. However, a higher resistance will be noticed when injecting in the paratracheal space. Second, at caesarean section as the fetus is semi-transparent, it is possible to see the lungs and subsequently the presence of a visible dye (e.g. Chinese ink, fluorescent molecules). A last option to assess a correct injection is by optical imaging and more specifically bioluminescence imaging. BLI is an elegant system to non-invasively follow-up gene expression of the reporter gene firefly luciferase, but the spatial resolution and anatomic information are limited. Magnetic resonance imaging (MRI) provides high resolution, tomographic images containing detailed anatomical information. Therefore we investigated the combination of BLI with MRI to obtain an overlay image, which combines the surface BLI signal with a visualization of the deeper anatomical structures (internal organs). Our aim was to obtain more detailed in vivo information of the localization of gene expression to be able to distinguish a correct from a wrong I.T. injection. Combined BL-MR images were acquired on several animals injected I.T. with rAAV2/6.2 CBA-fLuc and CBA-LacZnls (3x1010 GC/fetus for each vector, n=10) at one week of age (Figure 6). BL imaging revealed a signal emanating from the neck and the thoracic region. Co-registration of MRI with BLI located luciferase gene expression in the pulmonary region following a correct injection (Figure 6 a), but in the neck and abdominal area after an incorrect injection (Figure 6 b). Histological analysis by X-gal staining confirmed the in vivo co-registration. The survival to delivery of E18 old NMRI fetuses injected I.T. or I.A. with 30 μl 100 nm red fluorescent molecules was 100% in both groups and was defined as the number of injected fetuses alive at the time of harvest, 24 hr after the fetal surgical procedure (Table 1). The survival to delivery of fetuses injected I.T. or I.A. with rAAV2/6.2, which is defined as the number of fetuses alive at the time point of caesarean section 36h post fetal injection, was 85.3% and 86.3%, respectively (Table 1). The early neonatal survival rate was 53.3% (I.T.) and 74.5% (I.A. ), respectively, and was calculated by correlating the number of pups alive 1 day after fostering with the initial number of fetuses injected. To obtain these final survival rates, we optimized the surgical peri-operative procedure protocol by using (1) inhalational isoflurane as anesthesia instead of the administration of a mixture of ketamine (75 mg/kg I.P) and medetomidine (1 mg/kg I.P), (2) a heating pad to prevent hypothermia during surgery, (3), a stereoscopic zoom microscope and (4) the operators getting more experienced with the surgical procedure. Figure 1. Intratracheal injection in E18 fetal mice. In this figure the main steps of the surgical procedure for fetal I.T. injection are depicted. In a first step one uterine horn is exteriorized. In a next step, a purse string suture is passed through the uterine wall and the fetal membranes (amniotic membrane and parietal yolk sac) over the area where later on the fetal head will be exposed through. Next, the head and the neck of the fetus are exteriorized through the hysterotomy, following which the fetal head is kept in hyperextension by a 5-0 polyglactin 910 suture on two forceps between the jaws. Under stereoscopic zoom microscopy (x10 magnification) the fetal trachea is visualized by making a vertical neck incision using sharp and blunt dissection. In a last step, a total volume of 30 μl of substance is injected into the trachea under direct vision through the stereoscopic zoom microscope. Figure 2. General overview of the experiment. Figure 3. Determination of the optimal volume for intratracheal injection. To determine the optimal volume for I.T. injection, 10, 20 or 30 μl (n=3/volume) of red fluospheres sized 100 nm were administered in E18 old fetuses and the lungs were harvested 24 hr later. Nuclei and actin filaments were stained with Hoechst 33258 and Alexa Fluor 488 phalloidin respectively. The relative fluorescence (ratio of red to blue fluorescence representing fluospheres and nuclear staining respectively) was quantified using ImageJ online software. Mean ± SD, analysis of variance, comparisons for each pair using Student's t-test, *p<0.05, ***p<0.001. Figure 4. Quantitative assessment of fluospheres in pulmonary tissue and biodistribution to the gastro-intestinal tract. 30 μl of red fluospheres were delivered to the fetal mouse lung after (a) I.T. or (b) I.A. injection in E18 pregnant NMRI mice to compare the efficiency of targeting the fetal mouse lung. Untreated control fetuses were used for normalization of fluorescent background signal. Nuclei and actin filaments were stained with Hoechst 33258 and Alexa Fluor 488 phalloidin, respectively. (c) The relative fluorescence (ratio of red to blue fluorescence representing fluospheres and nuclear staining respectively) was quantified using ImageJ online software. (d) The gastro-intestinal tract was positive for both the I.T. and the I.A. injected animals. Mean ± SD, analysis of variance, Student's t-test, ***p<0.001. Click here to view larger figure. Figure 5. Comparison of intratracheal and intra-amniotic injection following rAAV2/6.2 mediated gene delivery in the fetal lung. BLI signal at 1 week after injection of rAAV2/6.2 (3 × 1010 GC/fetus CBA-fLuc) with corresponding quantification of total photon flux. All animals were scanned, separated by black partitions, to avoid scattering of photons to neighboring animals. The pseudocolor scale depicts the photon flux per second, per square centimeter per steradian (p/s/cm2/sr). Measurements were obtained in a 4.3 cm2 rectangular region of interest. Mean ± SD, analysis of variance, comparisons for each pair using Student's t-test, *p<0.05. Figure adapted from Carlon et al., 2010. Reprinted by permission from Macmillan Publishers Ltd: [Molecular Therapy] (doi:10.1038/mt.2010.153), copyright (2010). Click here to view larger figure. Figure 6. Distinction between a correct and an incorrect fetal intratracheal injection following rAAV2/6.2 mediated gene delivery in the fetal lung. Combined BL-MR images were acquired on several animals injected I.T. with rAAV2/6.2 CBA-fLuc and CBA-LacZnls (3x1010 GC/fetus for each vector) at one week of age. BL imaging revealed a signal emanating from the neck and the thoracic region. Co-registration of MRI with BLI located luciferase gene expression in the pulmonary region following a correct injection (a), but in the neck and abdominal area after an incorrect injection (b). Histological analysis confirmed the in vivo co-registration. Scale bar = 100 μm. Figure adapted from Carlon et al., 2010. Click here to view larger figure. fluospheres I.T. 100 (8/8) n.a. n.a. I.A. 100 (5/5) n.a. n.a. Table 1. Survival after FETAL intratracheal AND intra-amniotic injection. a Survival to delivery, i.e. after fetal surgery and at caesarean section, before fostering. b Pups were only fostered if they were pink, moving and breathing normally. c The early neonatal survival rate is expressed as a function of the initial number of pups injected. Abbreviations: I.T. Intratracheal injection; I.A. Intra-amniotic injection; n.a. not applicable. The mouse strain we chose to work with is NMRI mice because they have an abundant number of pups (average litter size 14.4 ± 1.8, own data), tolerate interventions well and have good maternal characteristics. Placing the purse string through the uterine wall and the fetal membranes is a critical step as you only want to expose the fetal head and not the shoulders, otherwise repositioning is almost impossible without causing trauma. An optimal position of the fetal head stretched backwards is essential to make the incision exactly above the trachea so you avoid the big blood vessels (jugular veins) running parallel with the trachea. It is important to visually follow the insertion of the needle into the fetal trachea under the surgical microscope to avoid incorrect injections. Replacing the fetal head into the uterine sac without causing trauma is critical as you want to avoid injuring the fetal head, which would increase intra-uterine or postnatal mortality. The mother is killed by cervical dislocation only at the time point of caesarean section, not with initial CO2 asphyxiation, as this would negatively influence the viability of the fetuses. Cross-fostering leads to a higher survival of treated fetuses as natural vaginal delivery of operated fetuses only led to a survival rate of 18.6±16.9% compared to 62±14% for non-injected pups, in our hands. A fetal I.T. injection is more time consuming to perform compared to an I.A. injection. Depending on the surgeon's experience, 2-4 fetuses per pregnant mouse can be operated on to avoid having the mother mice being anesthetized for more than an hour. A volume of 30 μl is a maximum to inject into the fetal mouse trachea. Although some leakage can be detected immediately after injection, the fluorescent signal in the lung is highest after injection of 30 μl fluorescent molecules as shown in figure 3. The final survival rate after I.T. injection is lower than after I.A. injection (53.3% and 74.5%) but this is mainly due to an increased loss after cross-fostering. The early survival rate indicates that the fetal surgical procedure is well tolerated for both delivery routes (85.3% and 86.3%). It might be possible to perform fetal I.T. injections at earlier time points than E18. Performing fetal surgery at earlier time points could be advantageous as the fetal immune system might be less mature, which promotes immune tolerance against viral vector, therapeutic proteins, etc. Furthermore, expanding stem and progenitor cells might be more readily accessible. Targeting these cells could give rise to permanent genetic correction. However, performing fetal surgery at earlier time points might increase the risk of developmental aberrations, which has to be monitored for. Post-operative care of pups that underwent I.T. injection as a fetus, could be optimized even more to reduce the loss of animals due to cannibalism after placing them in a foster's nest. Changing the mouse strain of the foster mother might help. We chose NMRI for their good maternal qualities but other mouse strains such as Swiss mice might perform even better for fostering purposes. The novel surgical procedure to target the fetal mouse lung by I.T. injection can be used for fetal gene therapy of monogenetic lethal disorders such as Cystic Fibrosis, surfactant deficiency and α-1-antitrypsin deficiency. Prenatal therapy would be beneficial in these cases because treatment is started before the onset of the disease and can prevent irreversible damage. Furthermore, if stem or progenitor cells can be targeted, a lifelong correction could theoretically be obtained, as these cells would continuously provide progeny expressing the defect protein. Aside from genetic disorders requiring a lifelong correction, fetal interventions aiming for a transient therapeutic effect would be of use to study possible treatment options for prematurity where the underdeveloped lungs require temporary gene expression of surfactant, VEGF (for lung maturation and neo-vascularization), or anti-oxidant proteins e.g. superoxide dismutase. This procedure can furthermore be used to deliver compounds or toxins in utero for generating disease models. For example, lipopolysaccharide treatment, mimicking intrauterine infection, can be given in utero to interfere with fetal lung development, leading to a decreased postnatal lung function due to persistent chronic inflammation and structural anomalies19. Due to the specific targeting of the fetal airways, a higher transduction efficiency of the airways and alveoli can be obtained after injection of viral vectors, compared to the existing I.A. injection method. When viral vector titers are limiting (e.g. with lentiviral vectors), I.T. injection will prevent dilution of the injected vector into the amniotic fluid to maximize the amount of vector particles in the lungs. Avoiding dilution after fetal delivery is also advantageous for other bioactive agents such as recombinant protein or stem cells as costs can be reduced due to the smaller amount of bioactive substance needed for I.T. injection compared to I.A. injection. Fetal I.T. injection is independent of fetal breathing movements, which start to occur at E14 but are variable between individual animals20. This gives rise to a lot of variation in uptake between the I.A. injected fetuses, which can be reduced by I.T. injection. M.C. and A.V.d.P. are doctoral fellows supported by grants from the Institute for the Promotion of Innovation through Science and Technology in Flanders (IWT-Vlaanderen). J.T. holds a part-time Clinical Research Fellowship (KOOR) from UZ Leuven. D.V. is a doctoral fellow supported by a grant from KU Leuven, DBOF/10/062. M.M.d.C is a doctoral fellow supported by a grant from Conselho Nacional de Pesquisa e Desenvolvimento (CNPq) and Erasmus Mundus. Research was funded by IWT-Vlaanderen, by the EC grant DIMI (LSHB-CT-2005-512146) and by the In vivo Molecular Imaging Research group (IMIR) from the KU Leuven. We would like to acknowledge the UPenn Vector Core founded by James M. Wilson for their kind gift of the AAV6.2 packaging plasmid for rAAV vector production. Willson, D. F., Notter, R. H. The future of exogenous surfactant therapy. Respir. Care. 56, 1369-1388 (2011). Abdel-Latif, M. E., Osborn, D. A. Intratracheal Clara cell secretory protein (CCSP) administration in preterm infants with or at risk of respiratory distress syndrome. Cochrane Database Syst. Rev. CD008308, (2011). 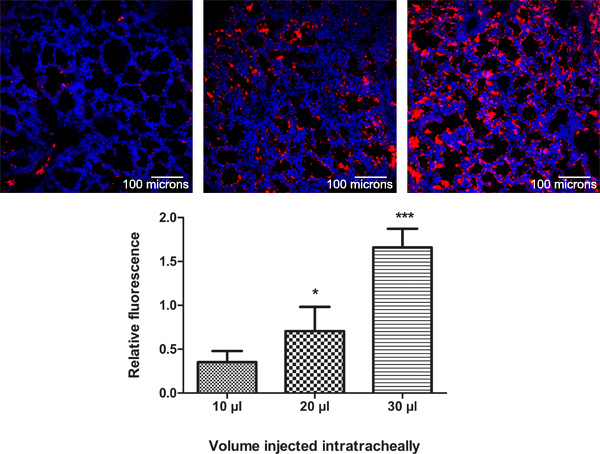 Thebaud, B. Vascular endothelial growth factor gene therapy increases survival, promotes lung angiogenesis, and prevents alveolar damage in hyperoxia-induced lung injury: evidence that angiogenesis participates in alveolarization. Circulation. 112, 2477-2486 (2005). Griesenbach, U., Alton, E. W. Gene transfer to the lung: lessons learned from more than 2 decades of CF gene therapy. Adv. Drug Deliv. Rev. 61, 128-139 (2009). Aneja, M. K., Rudolph, C. Gene therapy of surfactant protein B deficiency. Curr. Opin. Mol. Ther. 8, 432-438 (2006). Flotte, T. R., Mueller, C. Gene therapy for alpha-1 antitrypsin deficiency. Hum. Mol. Genet. 20, R87-R92 (2011). Roybal, J. L., Santore, M. T., Flake, A. W. Stem cell and genetic therapies for the fetus. Semin Fetal Neonatal Med. 15, 46-51 (2010). Peebles, D. Widespread and efficient marker gene expression in the airway epithelia of fetal sheep after minimally invasive tracheal application of recombinant adenovirus in utero. Gene Ther. 11, 70-708 (2004). Deprest, J., Gratacos, E., Nicolaides, K. H. Fetoscopic tracheal occlusion (FETO) for severe congenital diaphragmatic hernia: evolution of a technique and preliminary results. Ultrasound Obstet. Gynecol. 24, 121-126 (2004). Buckley, S. M. Intra-amniotic delivery of CFTR-expressing adenovirus does not reverse cystic fibrosis phenotype in inbred CFTR-knockout mice. Mol. Ther. 16, 819-824 (2008). Davies, L. A. Adenovirus-mediated in utero expression of CFTR does not improve survival of CFTR knockout mice. Mol. Ther. 16, 812-818 (2008). Mitchell, M., Jerebtsova, M., Batshaw, M. L., Newman, K., Ye, X. Long-term gene transfer to mouse fetuses with recombinant adenovirus and adeno-associated virus (AAV) vectors. Gene Ther. 7, 1986-1992 (2000). 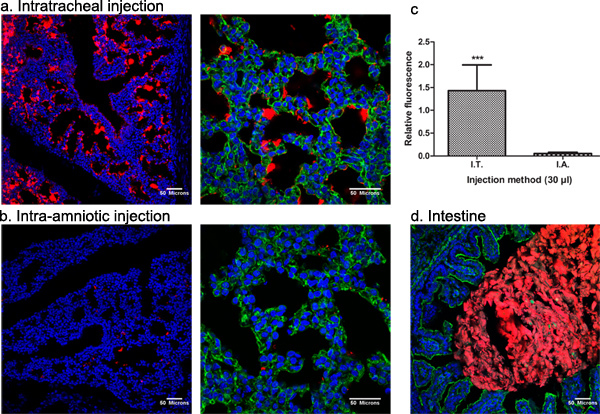 Henriques-Coelho, T. Targeted gene transfer to fetal rat lung interstitium by ultrasound-guided intrapulmonary injection. Mol. Ther. 15, 340-347 (2007). Toelen, J. Fetal gene transfer with lentiviral vectors: long-term in vivo follow-up evaluation in a rat model. Am J Obstet Gynecol. 196, e1-e6 (2007). Waddington, S. N. Long-term transgene expression by administration of a lentivirus-based vector to the fetal circulation of immuno-competent mice. Gene Ther. 10, 1234-1240 (2003). Waddington, S. N. Permanent phenotypic correction of hemophilia B in immunocompetent mice by prenatal gene therapy. Blood. 104, 2714-2721 (2004). Senoo, M. Adenovirus-mediated in utero gene transfer in mice and guinea pigs: tissue distribution of recombinant adenovirus determined by quantitative TaqMan-polymerase chain reaction assay. Mol. Genet. Metab. 69, 269-276 (2000). Carlon, M. Efficient gene transfer into the mouse lung by fetal intratracheal injection of rAAV2/6.2. Mol. Ther. 18, 2130-2138 (2010). Schmiedl, A. Lipopolysaccharide-induced injury is more pronounced in fetal transgenic ErbB4-deleted lungs. Am. J. Physiol. Lung Cell Mol Physiol. 301, L490-L499 (2011). Buckley, S. M. Factors influencing adenovirus-mediated airway transduction in fetal mice. Mol. Ther. 12, 484-492 (2005).